POWERTECH Capacitor Factory is a private enterprise that has the self-supporting rights of import & export.The leading products are Aluminum Electrolytic Capacitor for starting A.C. motor & A.C. Metallized Film Capacitor. We are a major manufacturer of the specialized A.C. Capacitor manufacturing ield in China. 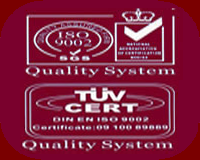 POWERTECH Capacitor Factory has passed the ISO9001-2000 edition of International Quality System Approval.The ”POWERTECH”Brand of CD60 type Aluminum Electrolytic Capacitor for starting A.C. motor,which applies to American Standard,has gained the UL American Products Approval first among this industry in China since July 23, 2001.And the CBB series of A.C. metallized film capacitor has also gained the UL American Products Approval since June 6, 2003. These achievements make POWERTECH Capacitor Factory become the only enterprise that have held two UL American Products Approvals among the A.C. capacitor manufacturing industry in China. POWERTECH Capacitor Factory has held a specialized research and development organiza- tion for products , and complete product lines for manufacturing capacitor. Depending on the foresighted understanding of capacitor technology with rich experiences, adopting high-level technology and keeping persevering research for high quality,POWERTECH Capacitor Factory continuously manufactures various types of high quality capacitor products. And the quality and performance has been widely and efficiently recognized. The products have been exported to more than 20 countries and areas, such as US, UK, Italy, Australia, Canada, Brazil, Saudi Arabia, Iran, Hong Kong and etc. " Based on sincerity, striving to be remarkable" , POWERTECH Capacitor Factory is continuously investing available resources to bend his mind to application and development of capacitor technology, improving producing technology, enlarging producing scales,establishing global marketing net.POWERTECH will supply the most satisfied products to customers all over the world with top-ranking product quality,top-ranking services, and favourable prices.